US media and public attention in 2017 has been captivated by the ongoing and ever-changing Russia-Trump saga. From the since-fired FBI Director James Comey testifying that there is an investigation into possible coordination between the Trump campaign and Moscow, to the recently revealed Donald Trump Jr. emails, the dramatic stories have been coming fast and furious. Consequently, concerns of the Kremlin’s interference in US domestic matters have dominated the Russia-related news in the US – and understandably so. Yet, the first half of 2017 has also seen major developments in Russian military and non-military activity in Eurasia, many of which have been overlooked. Just over a week after the inauguration of President Trump, following a few months of relative calm, fighting erupted again in the Donbas between Russian-backed separatists and Ukrainian government forces. According to the OSCE Special Monitoring Mission (SMM) to Ukraine, the last week of January was the most violent – in terms of ceasefire violations – in over a year, while the middle of March again saw a rise in the number and size of violations from Russian-backed forces. Further to the east in Georgia, Russia has continued the gradual process of swallowing the breakaway territories of Abkhazia and South Ossetia. In early March the separatist authorities in Abkhazia unilaterally closed two more crossing points between the region’s Georgian-majority Gali district and the Georgian side of the administrative border, disrupting freedom of movement and aggravating the already tense situation on the ground. Illegal elections were held first in Abkhazia on March 12, and then in South Ossetia on April 9. Upon being announced the winner of the latter election, the new South Ossetian leader declared that his “strategic goal” for the region was accession to the Russian Federation. This process of “accession” – or more accurately, annexation – has indeed long since been under way. Russia stations at least 4,500 troops in each region, along with tanks, armored vehicles and artillery systems. In South Ossetia, which has an approximate population of 53,000, the Russian military presence includes troops, border guards, and other units, and numbers well over 6,000. Though Russia officially recognizes these regions as independent countries, the reality of the situation, epitomized by the military-to-civilian ratio, is that they much more closely resemble militarized, imperial outposts. Perhaps the most obvious sign of Russia’s steady annexation was initiated through a March 14 decree by Putin ordering officials to finalize an agreement which incorporates South Ossetian armed forces into the Russian military’s command structure. The new defense agreement, signed on March 31, stipulates that some members of the separatist region’s armed forces can join the Russian military base in South Ossetia and serve as Russian soldiers. Further, the agreement states that the remaining South Ossetian armed forces will adopt new rules of engagement and operating procedures – which will be subject to Moscow’s approval – and that their objectives and structure will be determined in conjunction with Moscow. The result of these measures is that all South Ossetian troops will be either integrated with, or controlled by, the Russian military. The Russian regime has not confined its recently assertive activity to its so-called “near abroad.” According to the commander of US Forces in Afghanistan General John Nicholson, other senior military and intelligence officials, as well as first-hand accounts, Moscow has been providing weapons to the Taliban – in direct opposition to US and NATO interests. Despite evidence to the contrary, the Kremlin has denied arming the group stating instead that it has an intelligence-sharing relationship with the Taliban vis-à-vis ISIS. In Western Europe, the Dutch intelligence agency AIVD indicated in its annual report that Russia tried and failed to influence the outcome of the Dutch general elections in March by spreading fake news. Additionally, according to NSA Director Admiral Mike Rogers, the US notified France that Russians had penetrated their digital infrastructure prior to the hack that resulted in the leak of internal documents from Emmanuel Macron’s political party in the lead up to the French presidential elections. Macron’s opponent, far-right National Front leader Marine le Pen, who happens to support the Russian annexation of Crimea, has not only borrowed millions of euros from Russian sources in recent years, but on March 24 received an honor rarely bestowed upon candidates – a meeting with Putin at the Kremlin. Officials in Germany have repeatedly expressed concerns that Russian hackers will attempt to influence the outcome of their upcoming election in September. In the south, the Balkans have long been a hotspot of Russian covert and overt activity, with recent instances comprising Russian military intelligence allegedly orchestrating the abortive coup in Montenegro in late 2016, and Moscow encouraging Serb-majority Republika Srpska to secede from Bosnia. Much of Russia’s recent activity may seem disjointed and spontaneous at first glance, yet it follows certain broad principles and strategies spelled out in explicit terms by Russian military thinkers. In a 2013 article on next generation war, Colonel S. G. Chekinov and Lieutenant-General S. A. Bogdanov – prominent writers on strategy, asymmetric operations, and future war – predicted that upcoming conflicts will be dominated by information and psychological warfare, which will seek to “depress the opponent’s armed forces personnel and population morally and psychologically.” Chief of the General Staff Valery Gerasimov makes another key observation in both his widely-read article from 2013 and his more recent writing – that the previously well-defined lines between the states of peace and war have become blurred. This is on full display in Eastern Ukraine and Georgia. One clear example: commenting on the UN Security Council’s closed door discussion on Abkhazia and South Ossetia on March 28, Russian chargé d’affairs Petr Iliichev stated that the “situation in Abkhazia and South Ossetia is not a conflict” and therefore, the Security Council “should not bother paying attention to it.” This is against the backdrop of the military buildup mentioned above, as well as Russian troops in South Ossetia being put on the “highest level of combat readiness” on February 2. The crucial and symbiotic roles of military and non-military means, along with the ambiguous state of war versus peace, help explain much of Moscow’s strategy across Eurasia. US intelligence services overwhelmingly agree that the Kremlin meddled in the 2016 presidential election. As of now, it remains uncertain if this was done independently or with the collusion of the Trump campaign. However, to a degree, regardless of whether the Kremlin did or did not help Trump win, it has certainly gained from the result. 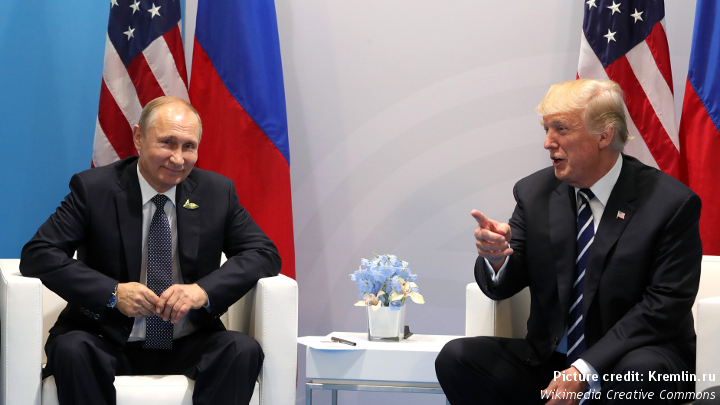 While Washington remains entangled in political infighting and a constitutional crisis – as it is now often called – Russia continues to steadily push forward its international agenda unfettered. The round of sanctions Trump recently signed into law will not change Moscow’s calculus regarding its strategy moving forward, just as prior rounds have done nothing to deter its actions in the first half of 2017. Indeed as the attention of the American public and media is consumed by the captivating story regarding the President’s potential ties to the traditional villain represented by the Kremlin, the latter is solidifying its strategic gains in Eurasia, along with other parts of the world. Moreover, by the time the international community truly notices, certain changes being implemented may be irreversible. 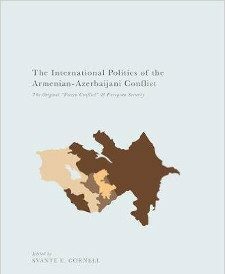 Though only Venezuela, Nicaragua, tiny Nauru, and Russia recognize the breakaway Georgian regions’ independence, their separation from Georgia-proper is becoming a fait accompli, and any prospects for future reintegration look increasingly problematic with each development. Likewise, the situation in Eastern Ukraine, not to mention Crimea, looks dire as far as the long-term prospects for the country’s sovereignty and territorial integrity. Russian-controlled military essentially run the Donbas, and it has become increasingly clear that Moscow desires neither the independence of the Donetsk and Luhansk regions, nor their outright annexation into the Russian Federation. A weakened and dysfunctional Ukrainian state is the ideal scenario for the Russian regime, and the best route for achieving this goal, ironically, is the fulfillment of the Western-supported Minsk II settlement. Even if other aspects of the agreement were fulfilled – a long cry from being the case – the Ukrainian state would then have to attempt to politically reintegrate Russian-controlled separatist elements, thus giving the Kremlin a say in Kiev’s decision-making. There is no question Washington is dealing with a serious issue in the form of possible coordination between the Trump campaign and Russia, and it is of great importance for the health of US democracy that a full investigation is completed. Meanwhile, however, the rest of the world continues to turn, and while allegations of its meddling are investigated, Russia presses on with its strategy – and with a freer hand than before. There are multiple ongoing investigations – as well as a newly-appointed Special Counsel – and they will find whatever there is to be found, though it may take a substantial amount of time and resources. In the meantime, the US must not vacate its interests and cede the strategic initiative to the very entity that it is investigating for interfering in its democratic process. George Tsereteli is a Europe and Eurasia Research Associate at McLarty Associates. He is a recent graduate of the Strategic Studies Program at the Johns Hopkins School of Advanced International Studies. The opinions expressed in this Policy Brief are those of the author and do not necessarily reflect the views of the Institute for Security and Development Policy or its sponsors.